This year our first regional event was the Northern Lights Regional in Duluth, Minnesota. We finished as the second ranked team with a ranking score of 1.75. 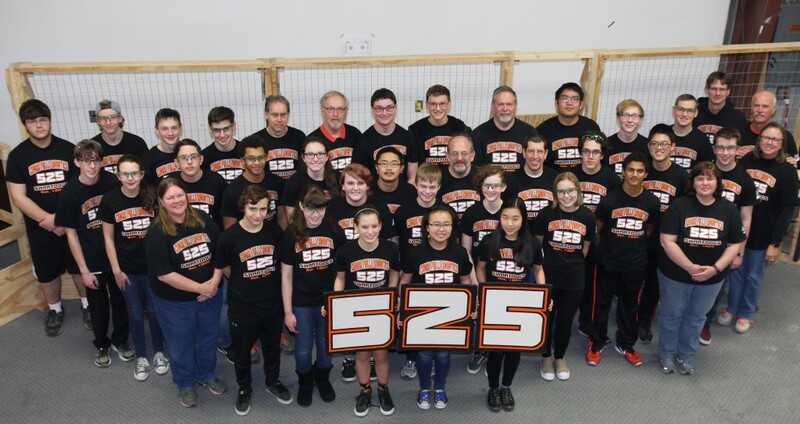 We were on the first seed alliance as team 2789’s first pick along with team 6758 as their second pick. We made it to quarter finals where we worked hard, but we ultimately came up short. However, we did earn the Industrial Design Award for our robot. Even though we had some disappointments, our team looked forward to making improvements for the upcoming Iowa Regional. Our second event was the Iowa Regional held in our hometown of Cedar Falls, Iowa. We finished as the fourteenth ranked team with a ranking score of 1.44. 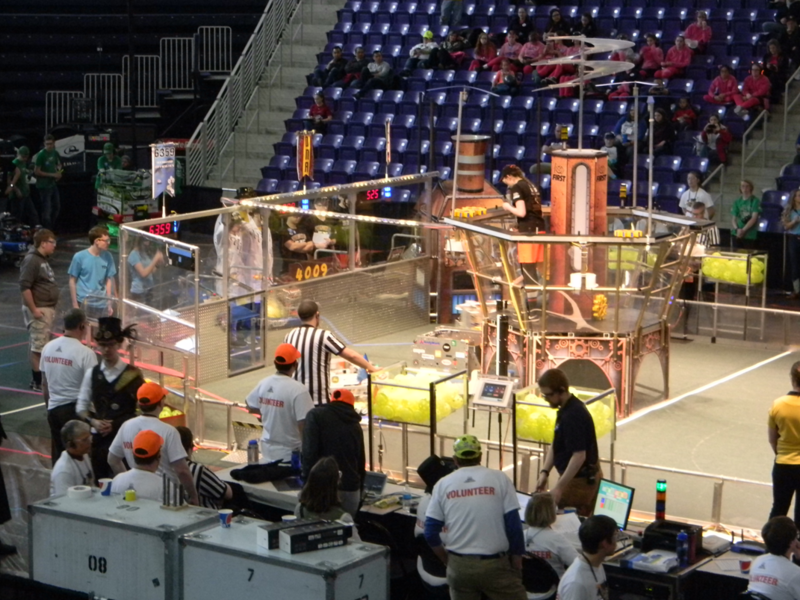 We were on the sixth seed alliance as team 4009’s first pick along with team 6359 as their second pick. We made it to the quarter finals where we again had worked very hard, but unfortunately came short due to some penalties. We did however earn the Creativity Award for our creative robot design. We were extremely proud of our mentor, Tom Ore, who was recognized as this year’s Woodie Flowers Award Finalist for the Iowa Regional. Tom works incredibly hard teaching students CAD, leading workshops, volunteering in all four FIRST programs, and doing amazing work in China. We are also incredibly proud of our mentor, Jan Newendorp, who received the Volunteer of the Year Award for all of her outstanding volunteer work for the Iowa Regional, the Cedar Falls FLL Regional Qualifier, and the FLL Jr. Expo. This year’s game was FIRST Steamworks. There were three main ways to earn points this year. First, there was a shooting aspect, where teams could shoot fuel cells (yellow wiffle balls) into boilers to earn points. 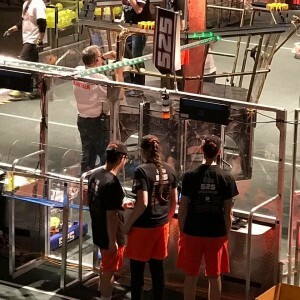 For each three fuel cells scored in the high boiler the alliance would earn one point, whereas nine fuel cells in the low boiler equaled one point during Teleop. However, during Autonomous one fuel cell in the high boiler was equivalent to one point and three in the low boiler were one point. Once an alliance got a certain number of fuel cells in they earned a ranking point. Second, teams could place gears on the pegs attached to airships. The gears were pulled up by the pilot, a new position this year. The pilots had three jobs, to pull the gears up, get rotors spinning, and to let the ropes down during takeoff, which took place during the last 30 seconds of a match. Teams could only have one gear at a time: they picked up gears either off of the floor, or from the feeder station. Once they got a certain number of gears hung, the pilots could activate a rotor (there are four rotors total). Once they had all 4 rotors spinning the alliance would receive a ranking point. Each individual rotor was equal to 60 points during Autonomous, and 40 points during Teleop. Lastly, during the last 30 seconds of a match robots could choose to hang on a rope thrown down by the pilots. 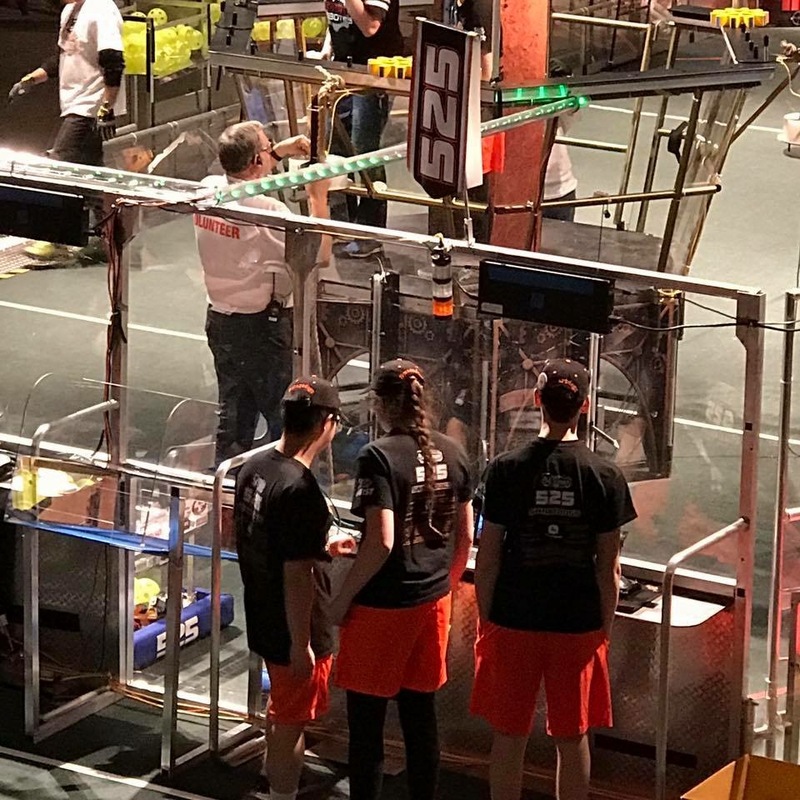 For each robot left hanging at the end, the alliance received 50 points.